﻿ Sindatek Instrument Co., Ltd.
Sindatek is the company dedicated solely to the production, sales, and support of contact angle tools. Our module designs suit practically every research and QC environment, we can also build custom instruments and fixtures to meet your specific requirements. We service and upgrade legacy instruments to extend the investments of our customers. We also offer a compelling lineup of current-generation instruments which employ the latest and most advantageous technological innovations. 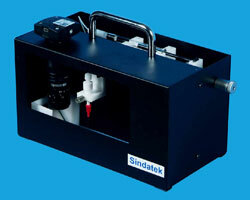 The Sindatek MD contact angle meter is an entry-level tool optimized for contact angle measurement. 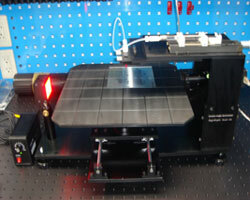 This tool includes a high-speed CCD FireWire camera, a proprietary LED backlighting system and ships with our own MD software. An affordable solution built on the time-proven design makes the MD Goniometer popular with researchers, universities, and in QC environments where budget retrains and requirements dictate an entry-level. All our models support every available option and is optimized for the most demanding and sophisticated requirements including dynamic studies, surface tension analysis, and studies that require elevated temperatures and highly controlled environmental conditions. The only difference between all models is the hardware constructions and your optional selections. 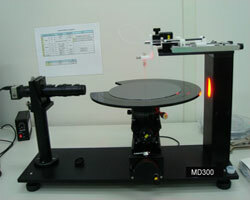 MD productss are automated instruments for measurements of static and dynamic contact angles even on absorbent materials like paper. 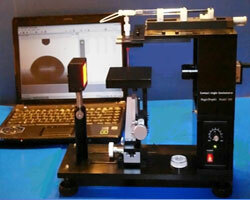 The camera captures a video sequence of the liquid droplet applied on the surface to measure contact angle (wetting), volume (absorption) and base width (spreading) of the droplet as a function of time. Connects to a standard laptop or PC with a USB port for operations. The Auto Dispensing Unit is a software-driven tool and control pump for creating single drops or dynamic drops such as required by advanced / receding studies. 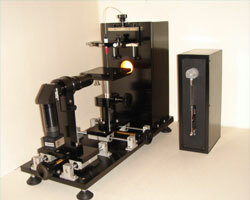 This step motor system uses disposable tips for multiple liquid studies and quick changes from one specimen to another. The system includes software, serial cable, a needle adapters, one 250uL syringe (other sizes optionally available), and one set of disposable tips. The ADU is provided as an optional package. The MD software has a number of features that make the procedure of surface tension and contact angle measurements easy and versatile. The type of measurement, number and timing, calibration, data presentation and analysis are all controllable within the program, and the exchange of data with other program by standard Windows procedures make further presentation and analysis convenient. 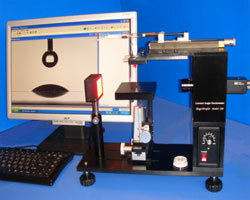 Sindatek contact angle meters can meet all your applications and specific needs ! 2009 Sindatek Instruments Co., Ltd. All Rights Reserved.